N400AN, American’s first Airbus A321neo, touched down at Pittsburgh International Airport (PIT) shortly before noon February 1. After clearing customs, the plane will head to American’s Base Maintenance facility at PIT, where it will spend a couple of weeks undergoing the usual extensive acceptance checks conducted whenever the airline adds a new aircraft type to its fleet. The Tech Ops – PIT team will install ViaSat satellite Wi-Fi, conduct general ops checks and add interior and exterior placards as they customize the aircraft for American. After that, it will visit other American bases before entering service. The A321neo is scheduled to begin flying customers April 2 between Phoenix Sky Harbor International Airport (PHX) in Arizona and Orlando International Airport (MCO) in Florida. Once the company takes more deliveries, additional routes will include PHX–Ted Stevens Anchorage International Airport (ANC) in Alaska over the summer, and PHX and Los Angeles International Airport (LAX) to Hawaii later this year as the A321neo begins to replace retiring Boeing 757s. The A321 is already a versatile aircraft, and the A321neo (which stands for “new engine option”) adds about 400 nautical miles in range thanks to improved fuel burn from the new engines, putting additional destinations within reach. This entry was posted in American Airlines and tagged A321neo, Airbus A321neo, American Airlines, N400AN on February 2, 2019 by Bruce Drum. Air Astana (Almaty) has taken delivery of the first Airbus A321neo at the Airbus facility in Hamburg, Germany. The aircraft is on an operating lease from Aercap, with the deal including two further A321neo and one A320neo aircraft for delivery planned in 2018. Air Astana currently operates 13 Airbus A320 aircraft and one A320neo, which was delivered in 2016. The carrier plans to increase the fleet of A320neo family aircraft to 17 by 2020. Photo: Air Astana. The pictured Airbus A321-271N D-AYAK (msn 7567) became P4-KDC when it was officially haned over on December 30, 2017. This entry was posted in Air Astana and tagged 7567, A321-271N, A321neo, Air Astana, Airbus A321-271N, Airbus A321neo, D-AYAK, P4-KDC on January 5, 2018 by Bruce Drum. Vietjet has become the first airline in Southeast Asia to take delivery of an AIrbus A321neo (new engine option) after the Airbus aircraft landed at Tan Son Nhat International Airport from Hamburg, Germany. The A321neo, registered as VN-646, is powered by Pratt & Whitney’s latest-generation GTF engines. Fitted out with 230 comfy leather-covered seats and high-quality carpeting, the first five rows of Vietjet’s spacious new A321neo have been especially designed to accommodate passengers flying Skyboss, the airline’s premium service. The aircraft’s interior also features a unique color-changing LED light system and striking décor to create a comfortable and refreshing ambience through the whole cabin. The brand new A321neo incorporates the latest in engine design, advanced aerodynamics and cabin innovations. According to the aircraft manufacturer, its GTF engines offer a significant reduction in fuel consumption — at least 16 percent from day one and 20 percent by 2020 — as well 75% reduction in noise and 50% in emissions. The engines were first introduced by Pratt & Whitney in 2016. Vietjet is one of the very first airlines in the world to incorporate the engines to its aircraft. The A321neo is also the 17th aircraft delivered to Vietjet from Airbus in 2017. The new aircraft will begin operating on domestic and international routes to and from Vietnam in January 2018. 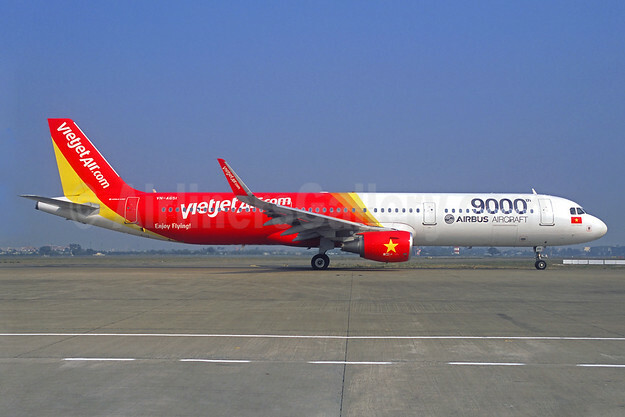 On receiving the aircraft, Vietjet also announced its decision to upgrade an existing order for 42 A320neo aircraft to the superior, and larger, A321neo models. Accordingly, the airline now has a total of 73 A321neo and 11 A321ceo on order for future delivery. This entry was posted in VietJet Air and tagged 2018 calendar, A321neo, Airbus, Airbus A321neo, Vietjet, VN-646 on January 2, 2018 by Bruce Drum. Air Lease Corporation (ALC) on December 14, 2017 announced that Azores Airlines-SATA International (Portugal) received its first new Airbus A321neo aircraft. This aircraft is the first of six CFM Leap 1A engine-powered A321neos to be delivered to Azores Airlines from ALC’s order book with Airbus. The next five A321neos will deliver between now and early 2021. The pictured Airbus A321-253N D-AVYI became CS-TSF (msn 7972) on the handover. 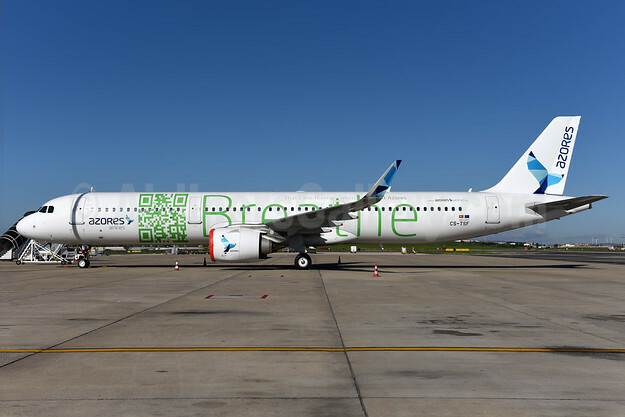 The airliner is painted in a special “Breathe” livery. The airline, fully owned by SATA (Sociedade Açoreana de Transportes Aéreos) becomes the first Portuguese operator to receive a member of the A320neo Family. By way of an extensive transatlantic network, these aircraft will connect Portugal and Azores to cities in the United States and Canada, in addition to major Western European cities. The six new ALC A321neo aircraft will progressively replace Azores’ aging Airbus A310s on routes from Azores to the USA and Canada as well as on the airline’s high frequency network to Portugal and Western Europe. Photo: Azores Airlines Airbus A321-253N WL CS-TSF (msn 7972) (Breathe) LIS (Ton Jochems). Image: 940745. This entry was posted in Azores Airlines and tagged A321neo, Airbus A321-253N WL, Airbus A321neo, ALC, Azores Airlines, CS-TSF, D-AVYI, msn 7972 on December 14, 2017 by Bruce Drum. Three years after launching as an exclusively business-class boutique airline with trans-Atlantic routes on July 4 2014, and a year since doubling its daily flights between New York and Paris, La Compagnie is accelerating its development with an order of two Airbus A321neo aircrafts. This investment in the new Airbus aircraft marks a major milestone for the still-young boutique airline, revealing stable growth and progressive future development. Due for delivery in 2019, the thoroughly modern, efficient and eco-friendly A321neos will take La Compagnie’s in-flight business-class experience to new heights with the latest technologies, Wi-Fi service and “full-flat” beds, ensuring passengers are well-connected and well-rested upon arrival in New York or Paris. The choice of the French aeronautical firm Airbus, which is headquartered in Blagnac and has manufacturing facilities across Europe and around the world, strengthens La Compagnie’s “French-in-spirit” philosophy that has made the carrier so desirable for intercontinental passengers. The two Airbus A321neos will be introduced to the La Compagnie fleet in 2019 with a full business-class configuration and the most attractive fares on the market. This entry was posted in La Compagnie and tagged A321neo, Airbus, Airbus A321neo, La Compagnie on September 22, 2017 by Bruce Drum.